In the introduction to his award-winning book, Story, Robert McKee, who is held as the world’s premier screenwriting teacher, expounds on a series of characteristics that define story: principles, not rules; eternal, universal forms, not formulas; archetypes, not stereotypes; thoroughness, not shortcuts; realities, not the mysteries of writing; mastering the art, not second-guessing the marketplace; respect, not disdain, for the audience; and originality, not duplication. 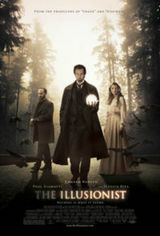 In this sense, The Illusionist, is no doubt based on a masterful screenplay. The movie tells the story of Eisenheim, a perfect role for Ed Norton-magician in turn-of-the-century Vienna. Right off the bat, we find ourselves in medias res as Chief Inspector Uhl, a good role for Giamatti, recounts the history of Eisenheim for Crown Prince Leopold, following the magician's arrest during what appears to be necromancy passed off as magic show. I won't get too deeply into the rich movie development, which includes a murder. Suffice it to say that the show is quite entertaining and becomes gripping when some of the apparitions that become Eisenheim's trademark begin to cast doubt over the Prince's actions. Inspector Uhl is dispatched at once to take care of the whole matter for the ambitious successor to the throne. During one of the dialogues between Eisenheim and Inspector Uhl, the magician suddenly declares to his by now numerous following that his work is, in fact, all an illusion. An illusion that has become a reality for the people attending his shows who still want to hear the stories; who seem to almost need to hear them. Human curiosity excited by the veil of mystery cast by the magician? Or maybe the atmosphere of suspenseful intimacy Eisenheim creates in the theater? Those elements play a role in what I believe has happened: the story creates an experience that does not require the magician to pass the test of truth. The emotional connection does all the heavy lifting. The experience feels real, and it is perceived as a truth by the people who choose to adopt that story as their own. "A story," writes McKee, "must not retreat to actions of lesser quality or magnitude, but move progressively forward to a final action beyond which the audience cannot imagine another." Treasured advice for the screenplay. How does the art translate into a more mundane form of communication for the rarefied world of luxury brands? Gianandrea at bizandbuzz ran a two part series on Luxe, calme et volupte' worth reading. In part 1 he takes us through the story of the rarefied ateliers where masters of illusion worked on the art of framing charming and affluent ladies as icons and symbols of a reality the rest of us could only aspire to. Just like in the story outlined above, the success experienced by the fashion houses brought upon them increasing pressure to expand their reach. As in turn-of-the-century Vienna, now the magicians need to perform at the pleasure of the stock market, which means casting a wider net *and* commanding the highest margins at the same time. In part 2, Gianandrea explains how it is done -- it's like going behind the scenes and looking at the trick. Just like Ispector Uhl, when he sees in his mind how Einsenheim managed for him to see only what he wanted him to see at any point in time, fashion houses that sell luxury goods continue to retain the air of mystique while making us want to continue to embrace the illusion of wealth and status associated with their brands. In taking a look at McKee's characteristics of story, I cannot help but be impressed: the principles of rarefied beauty and style continue to change, yet they remain the domain of the story of luxury items through eternal forms that appeal to the higher and universal realities of archetypes. Designers have mastered their art with thoroughness and originality proposing something new and fresh to their audiences with the regularity of consummate storytellers. A little black dress is not just a couple of yards of fabric; when it's Armani, it's a true experience. I attended McKee's seminar last June in San Francisco -- a point that stuck with me was, "life, on screen, is boring -- you must explore the depths of human experience." Big lessons for marketers throughout his work. Gianandrea -- you did some very fine analysis of a business model that is rarely understood. I hope we can drive some more people to that conversation. Richie -- I love learning. For many years as I welcome people to our business network in Philadelphia I've been asking them what book(s) they found most interesting and why. That alone allows me to stretch my reading into new directions. "Story" was one of the all times best books I ever read, especially since he gets into the magic and necessity of the use of subtext and in how the more real the story seems on screen, the less complicated it was made to be on paper. How do you manage to be so well-informed on everything? Robert McKee is THE guy when it comes to story. I cannot recommend his book highly enough. In fact, I had the pleasure to attend one of his two-day seminars on the subject of screenwriting and he is without doubt one of the best public speakers in the world. Even if you are not interested in the workings of stories, I suggest you get a copy of his book--it will change your life. On a related point, how many companies take into account narrative when they are building their brand? I think it's a neglected art. Everybody loves a good story, why not build one into your brand. Look at Apple--for so long the underdog they are now winning out against the big guys--and people are happy for them!